One of the main benefits of living in Colombia is the low cost of living. And what’s more, it’s a low cost of living in a country that offers many of the first-world amenities and infrastructure that you’d expect in a much more expensive location. 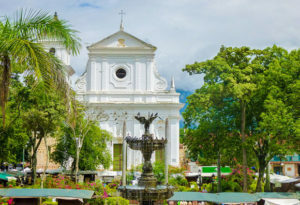 In other words, Colombia’s a good value from the perspective of an expat or second home buyer. Real estate prices will differ depending on the city and neighborhood in which you choose to live. In major cities, such as Medellín and Bogotá, home and apartment prices often rival those you’d find in North American cities. For instance, an American expat living in Medellín’s upscale El Poblado neighborhood pays about $1,250 a month to rent a three-bedroom high-rise apartment. But in a small town, like Líbano, you can rent a four-bedroom, four-bathroom house for about $350 a month. The same goes for buying property. While you can pay $1 million or more for a large two-story, El Poblado home, a comparable home in cities such as Manizales or Pereira will cost $250,000 to $300,000. Colombia uses a tiered, estrato (stratum) system to determine the cost of utilities, including electricity, natural gas, water, and telephone and internet service. The system assigns an estrato number to neighborhoods based on the average income of its residents. Lower estrato neighborhoods pay lower rates than higher estrato neighborhoods. For example, if you live in an “estrato 2” neighborhood, you will pay much lower rates than folks living in an “estrato 6” neighborhood will. The system applies subsidies to lower estrato residents. So, when looking for a home to buy or rent, choosing a mid- to low-level estrato can lead to a big monthly savings. If you move to Colombia, count on spending at least $1,300 per month for two people if you own your property; and $2,200 per month if you’re renting an apartment. A full-time maid will cost more, as will owning a car.